Jamestown, 1607-1699. Williamsburg, 1699-1780. 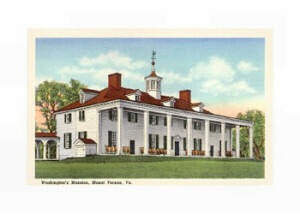 Richmond, since 1780. June 25, 1788, 10th State. Virginia Geography, 42,769 square miles. Virginia meets the Atlantic Ocean on the east. 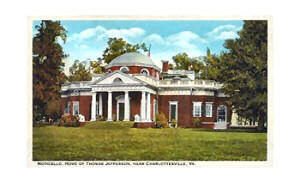 Constitution: Constitution of Virginia, 10th state to enter the Union. Services: The community, business and personal services group is the most valuable services industry in Virginia producing income through private health care, hotels and motels, computer programming and engineering companies and repair shops. The growth sector is in technology with business for computer programmers, consultants, engineers and researchers generated by the federal government. The world's largest Internet service provider is based in Virginia. Ranking second are the government and finance, insurance and real estate service groups. Government services include operation of public schools, hospitals and military bases. 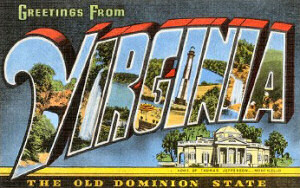 The Pentagon, the headquarters of the CIA and military bases are all located in Virginia. Rapid population growth has fueled the real estate market in the state with the construction of new homes, shopping centers and other properties. Falls Church and Richmond are the most important financial centers in Virginia. Ranking third in the services sector is the wholesale trade (coal, farm products, groceries) and retail trade (automobile dealerships, department stores, food stores, telemarketing, mail order) services group. Manufacturing: Tobacco products are Virginia's most valuable processed products produced in the manufacturing sector followed by beverages (soft drinks, beer). Ranked as Virginia's second most valuable group of manufactured goods are chemicals (pharmaceuticals, synthetic fibers). Production of transportation equipment (boats and ships, motor vehicle parts, trucks) ranks third in the state. Fishing: Virginia is a leading crab and oyster producing state. Other important catches are Atlantic croaker, summer flounder, striped bass, menhaden and spot. Mining: Coal is the state's leading mined product. Other products are crushed stone, sand and gravel, lime, kyanite and clay. Highest Point: Mount Rogers, 5,729 feet above sea level. Natural Resources: A variety of soil types and many mineral deposits are Virginia's important natural resources. Soils range from stony and not very fertile to loamy and easily cultivated sandy soils. Mineral deposits include bituminous and anthracite coal, basalt, dolostone, gneiss, granite, limestone, marble, sandstone, shale, slate and soapstone. Virginia House: Virginia State Delegates. Song: "Carry Me Back to Old Virginny" by James A. 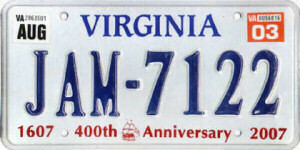 Bland, Virginia's official state song chosen in 1940, was redesignated as the "Song Emeritus" in 1997 to make way for a new state song. To date, a new state song has not been chosen and work by the State Song Subcommittee, whose last meeting was on January 5, 2000, has not resumed.